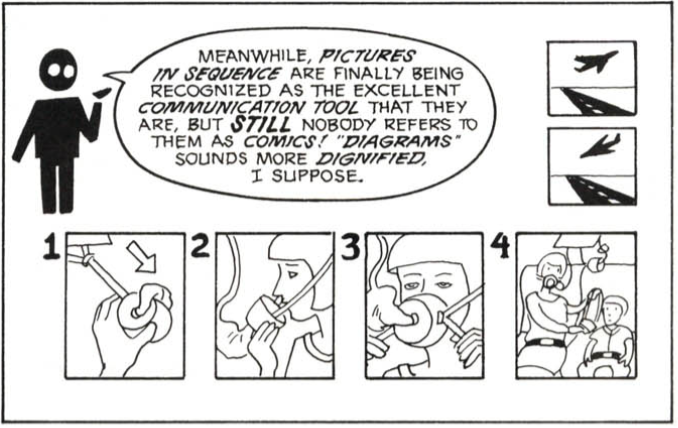 When first reading Scott McCloud’s printed book, “Understanding Comics,” I had some trouble figuring out how to read and follow along with a comic as it had been so long since I have actually read one. But once I got the hang of it, it was fun and I felt the reading went by much faster. The way McCloud had written the book included a lot of personable voice which made it more casual and easier to comprehend versus a wordy, lengthy textbook trying to inform the reader about how to compose a comic. One observation I took from his book was McCloud’s emphasis on how important the sequence was. To construct a comic, the sequence in which the art is placed in is crucial to create a comic. We were taught to read from left to right so the sequence of the comic is very important to be placed in order with how the story is supposed to portrayed as. When reading Eryon Franklin’s web comics, I found that it was more confusing and difficult to have to scroll down to get to the next strip versus just turning the page. I chose to read Franklin’s comic, “Bikram Addict.” Franklin’s comic was interesting to read and I enjoyed how it as written to more of a mature audience with the topics mentioned throughout the comic. I am used to reading comic books as a child so being able to read one that was centered for more of an adult audience was refreshing. That being said, while I was attempting to read the comic, there were adds that popped up on my screen which took away my concentration towards the comic. Reading work as a hard copy is much less distracting and how I prefer to read any sort of written material. I want to create a comic that would be made digitally but offered in print. I believe the traditional printed comic book has much more flare and detail to it than reading a PDF download, although that is the path commonly taken today. There is nostalgia and creativity I get when I read a picture book, or comic book in this case, that I would like captured in my comic and for my readers to get to explore for themselves.